Services are classes where you will write the Business Logic code or any other treatment that you want to make accessible to a controller or another service. The Logger delivered with Symfony2 is a service, like the Registry of Doctrine, which gives access to the EntityManager. The example below shows how to create a service, to pass two services it can use as parameters. Was added a node , passed the service name in the id attribute and PHP class in class attribute. As parameters we added 2 of type "service" : the Doctrine registry service (id = "doctrine") and logger (id = "logger"). 2- We create the MyService PHP class containing the code of our service "my_service". We first wrote the constructor that takes as parameters the that was defined in the services.xml file. EntityManager has been affected to $em property, and Logger to $logger. getTimeSinceLastCall that returns the duration (in seconds) since the last call. For each call of the URL /demo/my_service, we call our service's method insertTime that writes a record in the table my_service_table and logs a message. Then we call getTimeSinceLastCall that returns the amount of seconds since the last call of the URL, and returns the result to the view. 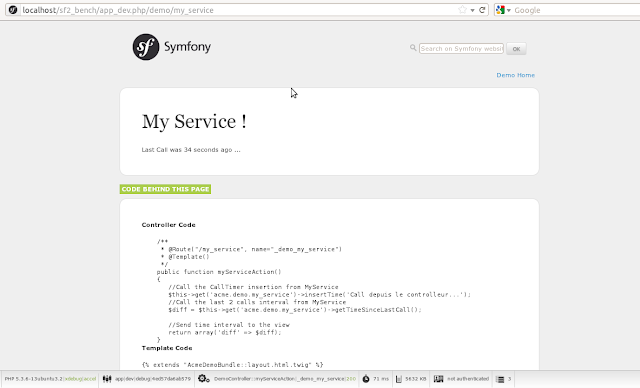 separtion the business logic into symfony service.